The Caliph's House is an account of the first year Shah and his family spent in Casablanca, renovating a dilapidated traditional house and attempting to fit in with the locals.Unfortunately, not all of my expectations were met. In many ways, The Caliph's House is a wonderful book full of simple but absorbing writing and Shah certainly does a good job at describing Casablanca and Morocco itself. Although there are sketches included, they aren't really necessary as, reading the book, I felt as if I was actually there with Shah and his family. The culture of the Moroccans (for example their belief in Jinns) is described with respect but a gentle humour that shows the high regard Shah has for his adopted country. As someone who has often daydreamed about packing everything in and moving to an exotic location, I enjoyed reading about the renovation of the house and how the traditional Moroccan artisans worked. But this was also where I felt the book fell down a bit; Shah's writing is much more suited to stories and atmospheres, not practicalities like finding a carpenter or fixing a sewerage pipe. The passages about the Moroccans and his visits around the country were enchanting, but the renovation sections seemed to drag. 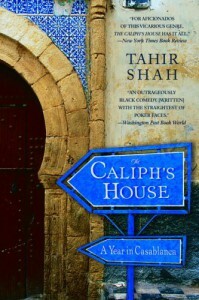 There's only so many times I needed to read about workers not turning up on time or the guardians of the house panicking about something the resident Jinn might or might not have done.All that is not to say The Caliph's House isn't a wonderful book - it is. It's just that In Arabian Nights is better (more about Morocco, less about house renovation) and I happened to read that first. The Caliph's House was worth reading for the descriptions and for the friendships Shah struck up with some of the Moroccans in the slum bordering his house; I had a soft spot for the refined stamp collector, Hicham. I look forward to reading some of Shah's other books in the future, particularly In Search of King Solomon's Mines and Trail of Feathers, about Peru.